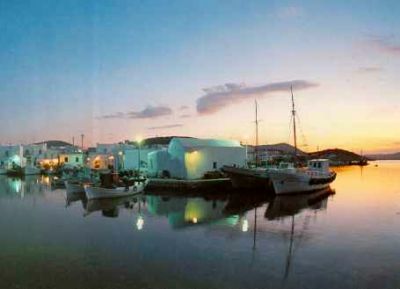 Paros Island, Cyclades Islands, Travel in Greece and Tourism Agencies. Second only in the Cycladic pecking order to Mykonos, Paros has become firmly established as a quality holiday destination. You may choose the lively, cosmopolitan atmosphere of the main port and town of Parikia. Although not eye-catchingly attractive, a visit to the original, old part of town will unearth a wealth of interesting shops, old houses with balconies that almost meet across the narrow streets and some delightful restaurants. Piso Livadi by contrast still possesses that quaint, fishing village atmosphere so beloved of true grecophiles. The standard necklace of taverns and cafes surround the sandy, village beach. A small quayside attracts the fishing boats like a magnet; their gaudy, yellow nets laid out to dry in the bright sunshine like a massive spider's web. The stunningly attractive village of Naoussa is our third holiday base on the island. A harbor crammed gunwale to gunwale with brightly painted caiques, narrow, winding alleyways "a la Mykonos" and some of the best taverns we have had the pleasure to frequent make this the ideal choice should Parikia be too busy or Piso Livadi too quiet for your tastes. Last but not least, on the east coast, lush, relaxed Drios boasts one of the best beaches on the island, Chryssi Akti, as well as a number of other sandy coves that will delight beach lovers.